Yesterday, those of you who follow me on Facebook may have noticed that I was out of town again for a bit. This time, it wasn’t for work, though! 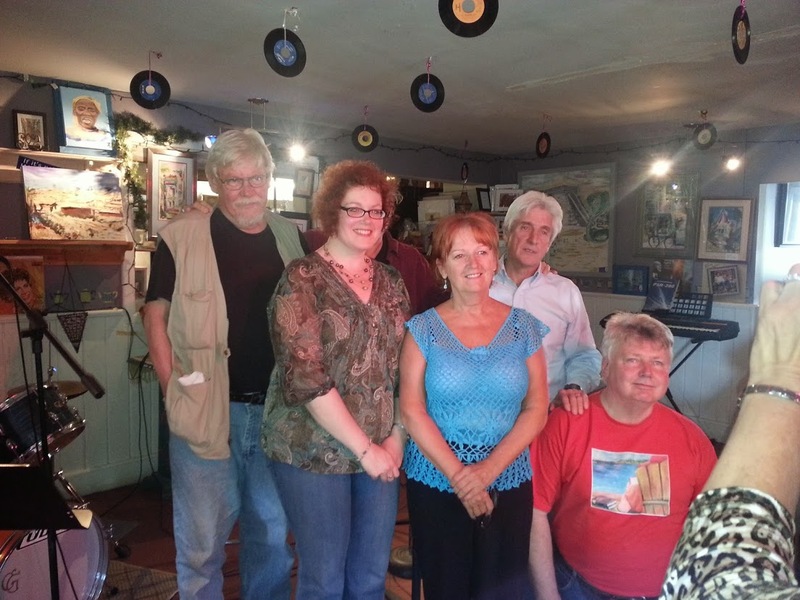 My gifted, poet friend, Kim Fahner (who is likely cringing as she reads this—stop that—you are gifted), was invited to a reading, irreverently called Fools on Stools at the La-Tea-Da Cafe in Rutherglen (about 20 minutes outside North Bay, ON). She asked me to go with her and we decided to turn the reading into an opportunity for a poetic road trip—my FAVOURITE kind! At the reading was fellow Sudbury author Ric deMeulles, and North Bay area authors Steve Pitt, Barry Grilles, and Ken Stange. We saw several poets and writers from the Conspiracy of Three reading series, and the host, Carin, who owned the La-Tea-Da Cafe, was gracious and welcoming. The group rotated through three sets of readings with breaks for refreshments. At the end, the readers were invited to make Fools on Stools a regular event. It was a lovely and creative afternoon. Kim sold several copies of The Narcoleptic Madonna, and received some publishing advice from the other readers. Then we returned to North Bay, checked into a hotel for the night, and set off in search of supper. The parking lot of Average Joe’s, to which we were referred by the helpful young man at the front desk, was full, so we turned into the downtown area to find sustenance. Since neither of us had had much by way of lunch, we were ravenous by this time. Fortunately, we saw My Thai Palace, a restaurant that we were both familiar with from Sudbury, parked, and dined. 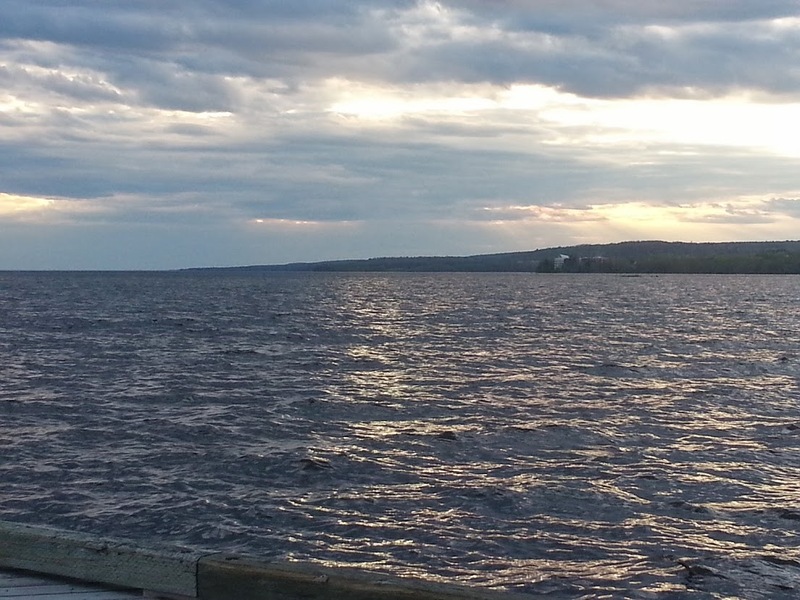 After a delicious supper and a half litre of wine, we moseyed down to the lakeshore for a walk. There was a beautiful ray of sun shining down on the water, but by the time I got my phone out for a picture, this was all that was left. Still, Lake Nipissing is wonderful. This morning, after a tasty breakfast at the hotel, we returned to town briefly to capture a daylight picture of the most amazing house. The house Kim had to go back to see. Turns out, the Canadian Pickers (the Canadian edition of the US franchise) had visited. I’m sure they found a lot of interesting stuff. As we drove away, we had to turn and drive around the block. 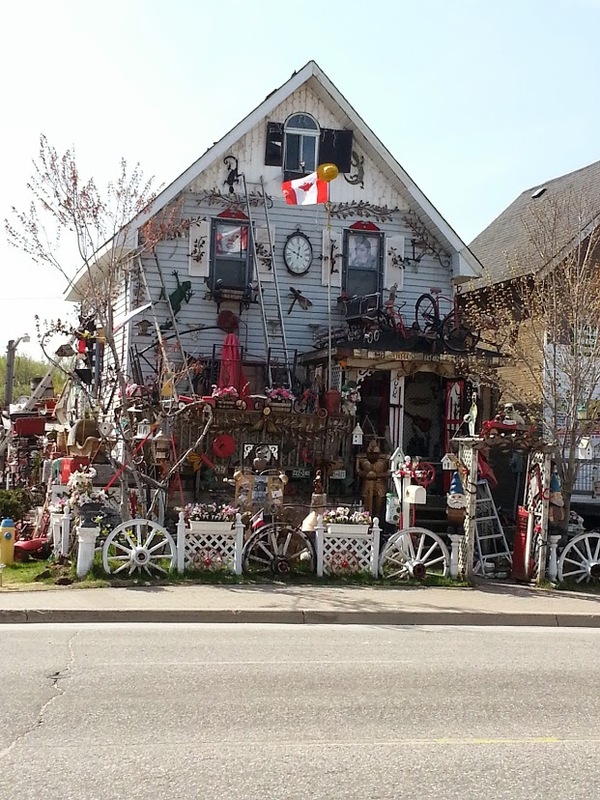 The entire property, yard, and garage were similarly festooned with collectibles. The drive back was uneventful and we continued our discussion of the world’s troubles and how to solve them. Sometimes you just have to get away and have some fun. Though I’ll admit, our fun may be tame in the eyes of others, but we had a blast. Have you gotten away for a fun weekend with friends lately?